It's no mystery that President Donald Trump likes to rattle off a laundry list of achievements since taking office. And as the seasons changed and the weather turned colder, that list turned festive. "Guess what?" Trump told those gathered at the Values Voters Summit in October. "We're saying 'Merry Christmas' again." When it was time to light the National Christmas Tree earlier this month, the president noted in his remarks that it was President Ulysess S. Grant who made it a federal holiday. "And I sort of feel we are doing that again," Trump said. "That's what's happening." What's really happening is a revival of a quintessential conservative culture war -- the "war on Christmas," to be exact. The controversy, premised on the notion that secular progressives are trying to eliminate hallowed Christian traditions from the public square, has long been a potent narrative on the right. Conservatives who enlisted in the fight insisted they were fighting the forces of political correctness and preserving a way of life in America that was under attack. To put it another way: it was the perfect wedge issue for Trump, one that he wrapped up and gave to his base. "Trump is no one's idea as an evangelical Christian, but he is very much using the same rhetoric as the war on Christmas," said Dan Cassino, a professor of political science at Fairleigh Dickinson University. "And it fits very much into his worldview that the people he's representing have been left behind by this liberal society." Trump promised victory in the yuletide struggle on the campaign trail, assuring supporters in 2015, "If I become president, we're going to be saying Merry Christmas at every store." But by that time, the controversy had become somewhat passé. 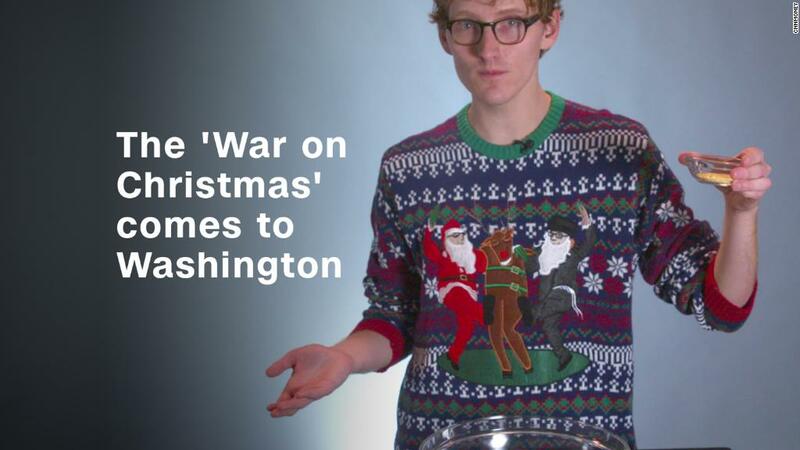 For years, beginning around the mid-2000s, the "war on Christmas" was an annual storyline for Fox News. Led by Bill O'Reilly, the network devoted countless hours of airtime targeting lawmakers and department stores that gave preference to more neutral greetings like "happy holidays." "If you're not going to say 'Merry Christmas,' and it's a federal holiday, I'm not going to buy the lamp," O'Reilly said in 2006. By 2016, however, O'Reilly declared victory in the "War on Christmas," and the storyline faded to the periphery on the network. But it didn't really go away. The same resentments that fueled Fox's "War on Christmas" hardened and evolved. And eventually, they were channeled by an unconventional candidate who promised to "make America great again."